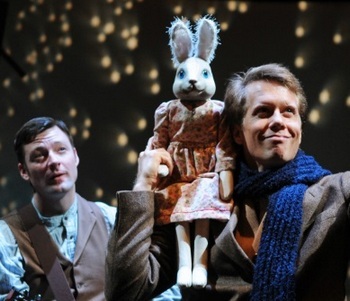 Gil Benbrook of TalkingBroadway.com posted this review of Childsplay’s 2014 remount of The Miraculous Journey of Edward Tulane. In it he describes the character work of Debra K. Stevens, Katie Mcfadzen and me as ‘revelatory’ in this very generous review of the remount. 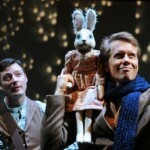 I love this show as it was a challenge for me both in acting and playing instruments on stage. But what was best about this remount of the show is that I got to work again with the same cast as in the original show: Kyle Sorrell, Katie Mcfadzen and Debra K. Stevens. There is so much respect between the four of us and there was a comfort and familiarity with the show that we all shared. It was a very unique experience for me and each day felt like a gift to get to present this show again. Kerry Lengel of the Arizona Republic posted this article as well that gives a good feel for how the cast felt about the remount.